Do flyer drops work? That’s a question that goes through the minds of many business owners contemplating whether or not to embark on a leaflet distribution campaign. I recently came across a blog post in which readers were being asked whether they had used door to door flyer drops as their marketing tool for their businesses and what their thoughts were on the same. What appeared to be the most widely recognized reaction was that individuals had fiddled with it and either they or their children had delivered the flyers. These people, however, did not receive the positive response they were after and therefore concluded that the campaign did not work and abandoned the whole door to door leaflet drops altogether. #1-Millions of pounds are generated each week in the UK thanks to leaflet drops. Flyer drops in the United Kingdom are estimated to be generating 12 million pounds worth of business per week. This figure was derived from surveying the large corporations meaning that the figure could be higher if small and medium-sized business were taken into consideration. 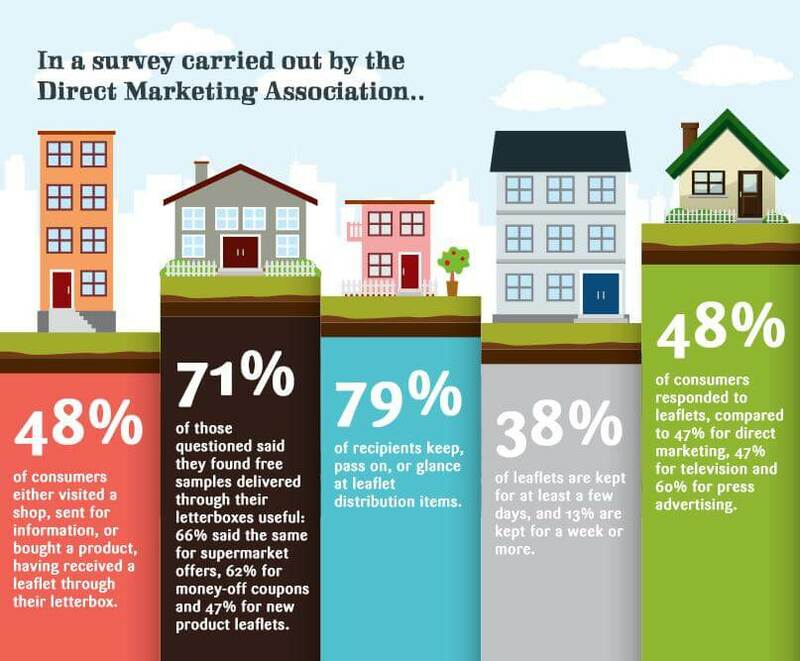 #2-Other forms of marketing require commitment and so does leaflet drops. Social media marketing is hot right now in terms of generating leads and helping companies grow. So if you were to join this bandwagon, you would not create say a Facebook page, post a number of updates and sit back waiting for instant success. Social Media marketing requires work. It would also be unfair to say that advertising on magazines does not work when you post a single ad and fail to get the results you were aiming for. You will have to run a few more ads and incorporate that with other forms of marketing in order to reach as many prospective clients as possible. The point of the assertion above is that, if you have conducted a few flyer drops on your own or sought the services of a company that you later found out was unprofessional and unreliable, that does not make you discredit leaflet distribution as a marketing tool for your company or business. You have a lot of other options and realizing that you did not go about your leaflet distribution campaign in the right way will help you reconsider this form of marketing that has the ability to blow your business out of the water. It is all about numbers when it comes to successful leaflet distribution campaigns. Impact will not be made by two or three hundred leaflets. Successful leaflet drops are all about numbers and this is what the business owners that had expressed their failure with their campaigns had failed to comprehend. They must have distributed a few hundred leaflets and saw that they were too time-consuming. Also, failure to allocate their time effectively may have resulted in the few drops that could not translate to big business for them. To attain the results that make a difference, professional leaflet distribution companies should be used. It is advisable to settle on a local company to carry out the drops as they know the area well and are well conversant with the routes to take when moving from one street or estate to another. By paying a professional to do the drops for you, you free up more time to be able to run your business. #3-Making leaflet drops work for you. Just like any other form of marketing, the response rates on leaflet campaigns vary greatly and there is no one-size-fits-all as regards to the specific results to expect. To make leaflet drops work effectively for you, you must first determine your target market. If you are in the restaurant or takeout business, anyone in close proximity to your business is potentially your market and thus ensuring that they all receive a leaflet for your business is likely to generate a great response. We are not talking about some plain and boring flyers here just to get your name out there. We are talking about using the right colors, with great and persuasive copy and get them professionally designed. Also, remember to include an offer that is hard to pass on or resist. All these will help you generate the great response you are aiming for. The approach would be slightly different if you run an auto body repair shop. How your flyer is designed could be the difference between one actually reading it or throwing it in the trash. The homeowner is also likely to be receiving several other leaflets on his or her doorstep, all competing for attention. Your flyers should be the first one the homeowner wants to read. It should stand out. Use eye-catching designs and colour combination and add clever wording to seal the deal. #5-Determinant of your flyer drop success. The leaflet distribution company you choose to work with is essential in the success of your campaign. It has to be RELIABLE, not because they say they are, but because they show it in their work. Look at their reviews from their clients as this might give you a snippet of their reliability and professionalism. Remember, flyer drops are all about reaching as many prospective clients as possible. It would be of no use to design the best flyers and then not have them reach the people you intended. It will not generate any response. A local flyer distribution company will be more effective as compared to a national company because local companies are more familiar with the area. Also, make an effort to contact the distribution company’s prior and existing clients to get firsthand information about how the company works. Consistency is key when it comes to leaflet distribution campaigns. Focus on building brand awareness first and lead generation will come naturally. People are more likely to remember your company if they keep seeing your flyers and they are more inclined to inquire about the business and even make purchases. When your company is memorable to people, they are likely to recommend you to their friends or family members seeking the products or services you are offering. You might have tried to conduct leaflet distribution in the past on your own but were unable to convert that into positive results. Consider changing your approach. Ensure you are working with the right leaflet distribution company and test different approaches to help you determine whether you want to stick with it or switching to other marketing strategies. Leaflet distribution campaigns have worked for my clients and I and I continue to use it for marketing purposes. I am available to offer advice if you need any on leaflet distribution. © 2019 LeafletDistributionTeam.co.uk | All Rights Reserved.